The playful food menus deeply embedded in the Sheng language first develop among a group of people close to each other before spreading to others. Nairobi News takes you through some of these names and how they were derived. 1. ‘Ugali chocolate’ for millet ugali; Ugali made of finger millet flour is associated with chocolate because of its signature dark brown colour that makes it look like it is the normal ugali mixed with the prized cocoa beans product. 2. ‘Teargas’ for pepper; Pepper sometimes sends tears rolling down a person’s cheeks, just as industrially-produced teargas. 3. ‘Chapati chafua’ to mean chapati in soup; To “chafua” means “make dirty.” Because a chapati in soup appears dirtied, whoever floated the nickname got their imagery right. 4. ‘Chapati mbao’ for a crunchy chapati; The ideal chapati is flexible and soft to the touch. When it dries up and gets flaky, then it earns comparison to rigid timber. 5. ‘Kahawa kifo’ for concentrated coffee; It is not clear why a high concentration of coffee boiled for a long time gets a deathly metaphor. But given that it is served without sugar and its blackness, one can understand why dark forces are invoked. 6 ‘Bof’, ‘brenyo’, ‘tothi’, ‘boflo’ for bread; Bread is one of the most prominent breakfast components and it is understandable when it takes the buttered side of food nicknames. 7. ‘Ugali mlima’ for a huge quantity of the dish; For ugali to get compared to a mountain, it must exhibit some sky-piercing qualities. Such a large quantity, caricatured in common mythology that it is so huge a cat can’t jump over it, is preferred by ugali enthusiasts and heavy-duty workers. A mountainous serving of that stature is known to go down well with tumbukiza, which is beef boiled while fully immersed in water until it is soft. 8. 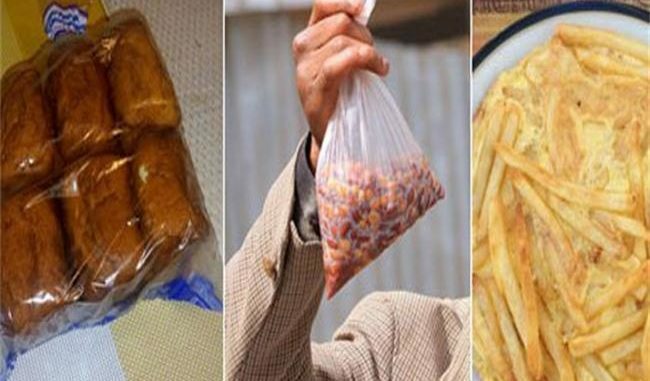 ‘Chipo mwitu’ for chips bought by the roadside; In Kiswahili, a thing with “mwitu” appended to its name means it comes from the wild. It appears French fries purchased from a roadside kiosk — normally measured in very cheap portions — falls in the category of food sourced from the wild. 9. ‘Ballast’, ‘combat’ for githeri; Because it is a mix of two grains of contrasting colours, githeri has earned a number of names. “Ballast” brings out the element of it resembling the mixture used in construction while “combat” dramatizes its resemblance to military garments. 10. USA, CNN, CMB; The initials should stand for United States of America, Cable News Network and Cash Money Brothers respectively. But in other contexts lingo, they stand for “Ugali, Sukuma na Avocado (USA)”, “Chapati Na Ndengu (CNN)” and “Chapati Mbili Na Beans (CMB)”. Probably, mouths are too busy chewing or salivating to articulate some food names in full.